Disclaimer: I am a paid brand ambassador for Velveeta Mini Blocks. All opinions expressed are my own. Fast, easy, delicious comfort food… that’s how I’d describe the latest recipe that my family tried making with Velveeta Mini blocks. You can read about our first two efforts here and here. 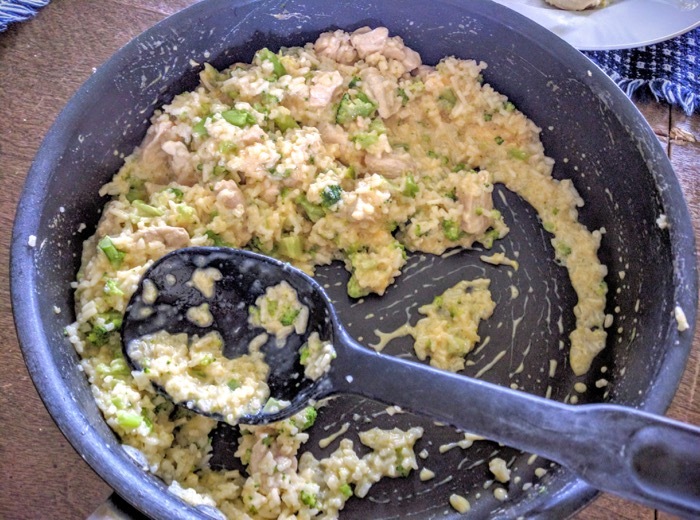 I went to velveeta.com and narrowed it down to a couple of recipes but ultimately decided on the Velveeta One Pot Cheesy Chicken and Broccoli Rice. Mainly because one of the grocery stores I frequent had a great deal on split chicken breasts. 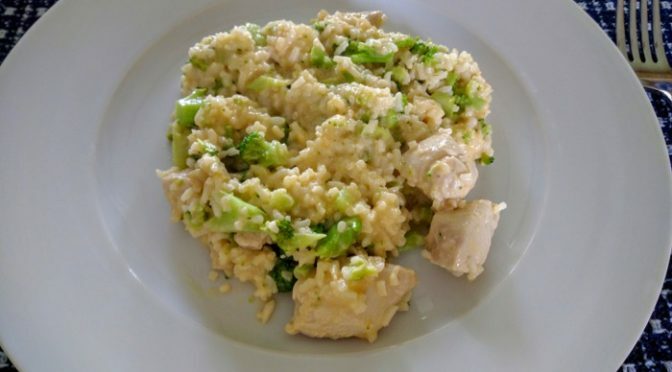 Sure, buying boneless, skinless chicken breasts are a lot more convenient but I’ll go with the split chicken breasts when I have the time and can save some money. As it turned out, I had plenty of time to cut enough chicken off the bone for this recipe and for our Cheesy Crock-Pot Chicken Bacon Tator Tot Casserole that we’ll be making later this week. 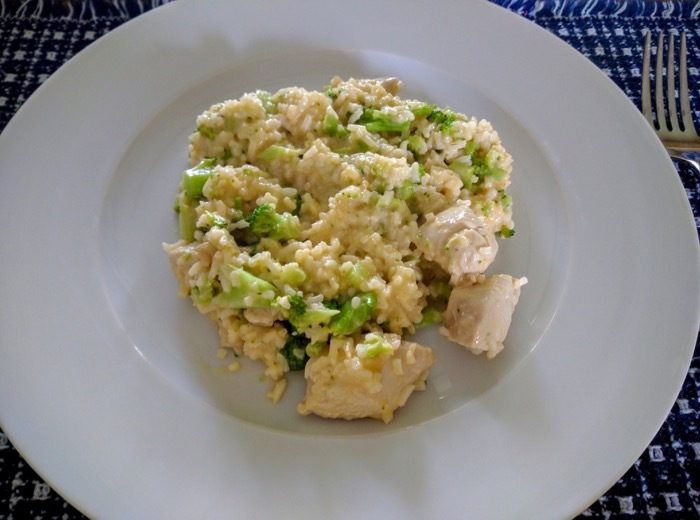 The reason I had plenty of time is because once I had enough chicken cut up for this recipe my daughters took over and finished the meal preparation. My oldest cooked up the chicken while my youngest cubed up two of the 4oz. Velveeta Mini Blocks. In no time at all my daughters had the meal complete! It took less that a half hour and that included the time it took for me to cut the chicken breasts off the bone. Since it’s made in one pan cleanup is easy. This is what I’d call a perfect weeknight meal. As we ate we discussed the recipe. We all thought the flavor was perfect! No need to add any salt or pepper at the table. My daughters are at the ages where they seldom agree on much and that was the case with the broccoli in this dish. One would prefer we use broccoli florets the next time we make this recipe. The other liked the smaller, chopped broccoli pieces. I, myself, liked the chopped broccoli. It made it so you got a piece of broccoli in every bite. We all gave this recipe a thumbs up. You know how I could tell the recipe was a winner? My youngest, who isn’t the biggest fan of rice, went back for seconds! My wife heated up the leftovers when she got home from work and she thought it was great too. Like I said in the beginning, this really is fast, easy, delicious comfort food. I could see me making this for a Church potluck and keeping it warm in a crockpot. If I did I’m sure it’d get lots of compliments and requests for the recipe. If you wanted, you could take this basic 5 ingredient recipe and add to it. Bacon crumbles, green onions, or chopped water chestnuts (for crunch) would all be great. This is one of my favorite “liquid gold” recipes that I’ve tried so far. I highly suggest you get some Velveeta Mini Blocks and make it for your family.